A week or two ago Julian's preschool began to post signs stating the last day of preschool before the Holiday recess would be December 18th. I noticed the signs and somehow conveniently forgot that meant I needed gifts for all five of his teachers almost a week before I was planning. Actually I am not sure I really forgot, it is more like I was a cross between repressed panic and full on procrastination. In previous years I have given preserves that I canned over the summer but this year I don't have enough, (unless I want to give everyone crushed tomatoes). Somehow baking bread for all five of them seemed daunting. Our budget does not allow to buy them all something they would actually enjoy, so I conveniently ignored the problem until it was almost too late. Then I found a recipe for caramel chocolate sauce that stated it would make old boot leather taste divine. Some people are drawn to recipes by photos of the finished product, personally I want to be seduced by words. Tell me why I want to put everything down and run to my stove and start cooking. Those words were enough to send me, and Julian once I clued him in to my plans, to run to the kitchen. Over Thanksgiving Sebastian was telling his Graunty Eva (my aunt) about the knife skills I am teaching him. When she asked Julian what he is learning to do in the kitchen he said, "I am learning to stay away from hot pans." For this recipe he also poured sugar and water, before staying away from hot pans. It really is a very easy recipe, one that is very hard to mess up. Unless of course your 4 year old assistant starts trying to pour himself a glass of milk from a very full gallon jug as the caramel starts to turn. Consequently the first batch is good but has an almost, but not quite, burnt sugar taste to it. A flavor that is often prized in high end kitchens, but not really what I was going for. I have made the sauce again and to avoid the almost burnt sugar taste, just do as it says and remove from the heat as soon as it starts to smoke, instead of pouring milk and missing the moment. The difference with today's batch is now I am searching for old boots, before I just served it on ice cream. it begins to get dark around the edges. Once it starts to darken swirl the pan continuously until the syrup is deep amber and starts to smoke. Immediately remove the pan form the heat and add the butter. Gently mix the butter in with a heatproof spatula or whisk. Once the butter is fully incorporated stir in the heavy cream. If the sauce becomes lumpy, heat over very low heat while stirring until it is smooth and promptly turning off the heat when it is smooth again. (Mine became lumpy but rather then heating I just kept stirring and it smoothed out). Add the finely chopped chocolate and stir until it is melted and incorporated. Stir in the vanilla and salt. 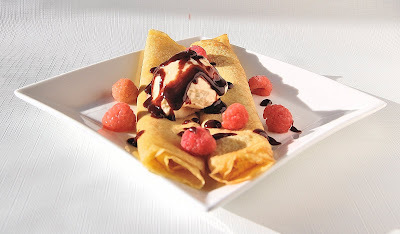 Serve warm on ice cream, cake, fruit, poached fruit, crepes, waffles, a spoon or old boot leather. If refrigerated it can be re-warmed in a microwave oven or with the storage jar set in a pan of simmering water. Should keep in the refrigerator for 1 month. To make chocolate caramel truffles reduce the butter to 4 Tablespoons and refrigerate the sauce. When cold spoon out teaspoon sized balls and roll them in cocoa powder. 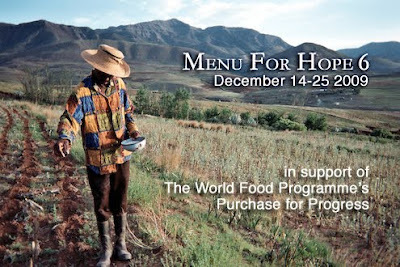 Menu for Hope is an annual charitable event from food bloggers around the world. Participating food bloggers offer food related prizes for the raffle. For each $10 donated anyone can earn a virtual raffle ticket to bid on any of the prizes of their choice. At the end of the two week menu for hope campaign the raffle tickets are drawn and the prize winners announced on Chez Pim. 8 oz Jar of my homemade Tomato Orange Marmalade. This is my 7 year old son, Sebastian's favorite topping for everything from toast to bagels. I love it as well but for me it is not a food group. It is also wonderful as an accompaniment to a wine and cheese course. 8 oz's of any of the wonderful and often award winning Vermont cheeses available to me in Burlington Vermont (I am guessing this is all of them). 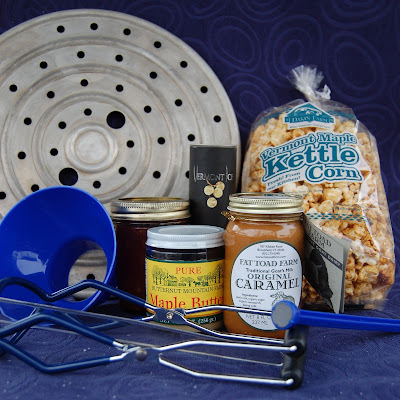 Essential Canning Tools: Jar lifter, magnetic lid lifter, canning funnel and a superior canning rack. The canning rack that comes with most water bath canners is just a reason to curse, they allow the jars to fall sideways and on top of each other. This one keeps all the jars straight, just where you place them. It will fit inside any stock pot with a diameter of 12.5 inches or greater. In addition the winning bidder can e-mail me with any water bath canning questions or concerns. A note on shipping, while I have placed no shipping restrictions on this package the winner should let me know of any restrictions on food or wine. In addition the winner is responsible for any customs duty. A complete list of this years bid items can be found here. So make sure to bid on item UE23 as well as many other delectable offerings on the First Givings Page. 2. Go to the donation page at Firstgiving and make a donation. 4. If your company matches your charitable donations, please check the box and fill in the information so we may claim the corporate match. 5. Please make sure to check the box that allows us to see your e-mail address so we can contact you if you win. We will not share your e-mail address with anyone else. Check Chez Pim on Monday January 18th for the results of the raffle. It is officially winter out with temperatures below freezing and even in the teens at night. On Wednesday I walked to school with 2 boys who insist on wearing there sledding goggles every day along with face covering hats. They and their friends happily threw snow at each other, rolled in it, kicked it, and occasionally walked forward. When I collected Sebastian off the bus he and Julian and 2 other neighborhood children broke out into a spontaneous gleeful snow ball fight. One little girl chose to stand next to me and eat fists full of fresh snow while her sister and the other children ran around flinging snow at each other. I stood there on the street happily watching them, thankful that I had put on my snow pants so they could play and I would not freeze into a pillar of ice. Lia, the snow eater, ended up shivering and cold. A return to winter also means a return to my CSA having storage vegetables instead of a bounty of freshly grown produce. If you are new to visiting my blog, then you have not yet heard of the cabbage that is part of my biweekly winter vegetable share and its test to my creativity. Cabbage is one of the many vegetables that people largely left behind when refrigeration and global food production took hold. It still has a place on peoples plates but mostly as coleslaw and sauerkraut, as well as an appearance on St Patty's Day. Personally I don't really like coleslaw and especially not when the outside temperature is below freezing. So the trick is to come up with uses for the 8 cabbages I receive over the winter that are inventive and delicious. Every winter I get better, figuring out another trick that makes me look forward to cooking with and eating my cabbage share. Yesterday I added a recipe that moves cabbage more firmly into the category of vegetables I love. It began when I found a recipe on Smitten Kitchen for Cauliflower with Almonds, Capers and Raisins. Part of being successful with my CSA is not to run out and buy every vegetable I see a tempting recipe for, but instead cook with what I have. Therefore I could either wait until March, and the end of the winter CSA, or find a substitution from what I have. As I read and reread the recipe, lusting after the flavors, I began to imagine it with cabbage instead of cauliflower, as they have a similar flavor profile. When I went to make it I decided to also use some kohlrabi, not because I thought the dish needed it, but because the cabbage I had was so small. I also had to modify the cooking technique as the one time I tried to roast cabbage I found it brought out some of the more off putting flavors of cabbage rather then caramelizing and sweetening it. I also used more topping, just because it sounded so good. The original recipe calls for fresh parsley, tarragon and chives. I substituted fresh cilantro as I will have less trouble using the leftovers and I knew the flavor would work well with the other ingredients. The end result was an epiphany of what cabbage can be. The cabbage was browned and caramelized in spots with a flavor very similar to cauliflower, only subtler. Then there was the counterpoint to the cabbage and balance from the other flavors, sweetness from the raisins, a mild acidity from the vinegar, sharpness from the capers, earthiness from the almonds and the crunch and richness from the bread crumbs. The cabbage also had a very fresh taste in this dish, which is really wonderful for a vegetable that was harvested at least 2 months ago. Heat a large skillet over low heat and add 2 Tbsp butter (my skillet is 13 inches in diameter). When the butter is melted add bread crumbs and cook while stirring until toasted and fragrant, approximately 3 minutes. Transfer crumbs to a bowl and set aside. Wipe out or clean and dry skillet. Place skillet over medium heat and add 2 tsp olive oil. Add almonds and sauté until lightly toasted and fragrant (although this may be a little hard to judge as the almonds are brown to start with. It should take about 2 to 3 minutes). Season with Kosher salt and freshly ground black pepper, using a light touch. Transfer almonds to a plate or cutting board and when cooled chop each one into 3 or so pieces (the original recipe that Deb from Smitten Kitchen was following specified cutting them into thirds which she found laughable until she tried it. Turns out when you chop almonds thirds is the most reasonable way). Wipe out or clean and dry skillet and add remaining 1 Tbsp oil, heat the oil over high heat and add the cabbage and kohlrabi if using. Cook the vegetables over high heat, stirring occasionally until browned in spots and tender. (At this point my guess is this took 15 or so minutes, next time I promise to pay attention). While cooking the cabbage and kohlrabi melt remaining 1 Tbsp butter over low heat in a small saucepan, when melted add the raisins (or other dried fruit) vinegar and 2 Tbsp water. Simmer until raisins are plump and soft, drain and set aside. In a small bowl combine almonds, capers, raisins and cilantro. Season well with pepper and set aside (as my capers where salt preserved I did not add any salt, if yours are brine preserved add salt to taste). Toss so everything is well mixed. Place cabbage and Kohlrabi on a serving platter or casserole dish and spoon almond, caper herb blend over the top and then sprinkle with the bread crumbs before serving. 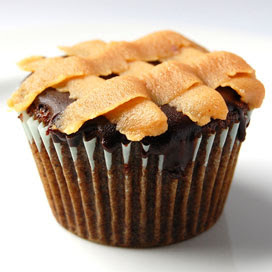 I know I said vote, but really I meant, please vote for my Gingerbread Cupcake with Chocolate Ganache and Peanut Butter frosting recipe in the blog envy contest. Voting does require you to register, and to make your vote count you have to vote in all categories. However voting enters you in a contest to win an "epicurean adventure" in the U.S. city of your choice or a kitchen technology center. The Bon Appétit test kitchen will make the winning recipe in each category and choose a winner from those. The overall winner will receive a trip for two to New York City and dinner with the editor in chief of Bon Appétit as well as the restaurant editor of Bon Appétit. I will not even attempt to explain how much this would mean to me. instead I will just say I will appreciate each and every vote I receive and leave it at that. Yesterday I was picking up my winter share when I overheard a couple questioning if it was "realistic" for them to take the 2 pounds of kale. If I was the shy quiet type I would have quietly bagged up my share while I ruminated on people with the will power to leave some of the vegetables offered purely because they know they will never eat it. Instead I told them how to make kale chips. After I was done talking they reached for a bag and began weighing out their kale, maybe it was the fact my children love kale chips that sold them. When they were having the same conversation about the Brussels sprouts I suggested that they roast them . As they added those to their bags they both commented that I should have a blog. 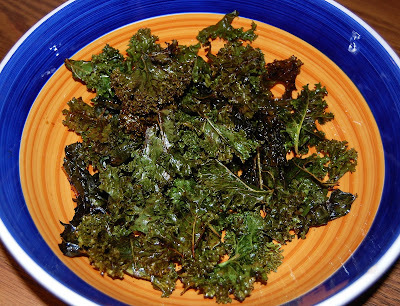 My kids don't just eat kale chips, they cheer when I make them. It is one of my very favorite forms of kitchen brainwashing. Yesterday as I was making dinner the kale chips were done first and they began making trips into the kitchen to steal some. At one point Lewis told them no more kale chips until dinner, at which point I wrestled him to the ground to silence his lunatic ravings. Actually I believe the laser beam that shot out of my forehead was enough of a deterrent. I brought these to a potluck "tea party" at Julian's preschool and anybody who tried them liked them. It can be a challenge to get adults to try new foods as well as preschoolers. I got a real kick out of the adults who would politely and very cautiously take one chip when I offered them. As soon as they tasted them they would ask if they could have more. One of Julian's classmates took a huge plateful and systematically ate the crispiest ones first. I'm not sure where I first heard about kale chips. I know I saw it on my friend Cheryl's blog but I also heard about it from several friends, there where mentions of them on facebook as well. 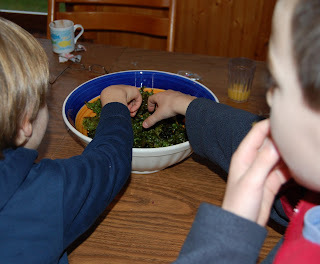 The first time I made them Sebastian looked at what I was making and said, "Are you making kale chips? I love kale chips." He loves kale chips and I love other people introducing my children to healthy foods. Thank you Alice! I have taken a little while to post about them because I have been monkeying with the technique and the dressing. In the beginning I was just putting olive oil on them and a sprinkling of kosher salt. They were good, but often times they were either over or under salted. Then there was the issue of temperature and timing. 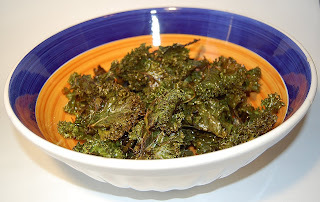 over the last several months there have been many over browned kale chips from my kitchen. I solved the salting issue by adding soy sauce to the dressing and we also like them better with vinegar. The temperature and timing is what works best in my oven. Use this recipe as a guideline as your oven temperatures may be calibrated differently. Preheat the oven to 275° with convection or 325° without convection. Remove the kale from the stems and tear into chip sized pieces. Wash and spin the kale dry and dump out onto a half sheet pan. Whisk the olive oil, soy sauce and vinegar together until emulsified (thats a fancy word for combining together liquids that normally don't). Pour the dressing on the kale and rub it onto all the pieces so they are well coated. Divide the kale between two half sheet pans and spread out well on each sheet. Place in the oven and cook for 12 - 15 minutes. If your oven does not have convection take the kale out half way through and stir it around to ensure even cooking. The kale is done when it is really crispy. Pour into a bowl and serve, or leave the bowl in the kitchen at child height while you prepare dinner and allow shameless pilfering. 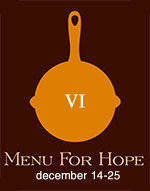 For any other food bloggers out there I urge you to take part in Menu for Hope 6. It is a great way to help those in need while getting new traffic for your blog. For me it feels right to help those in need of food while I have the time to photograph and savor what we have. As someone who often cannot afford all that I would like to feed my family it is nice to remember how much we do have and share with others in greater need. If you are interested in participating all the information you need can be found at Chez Pim and her Call for Participation. I am trying to construct a raffle prize that at least 20 people will bid on. Some times it feels like am talking to myself here, although the statistics say otherwise, so I am a little leery of assuming my loyal readers will bid. The package I am planning on will have some Vermont treasures as well as tools that I feel are essential in my kitchen. If there is something that would drive you to bid, please let me know. Check back here on December 14th for my prize announcement as well as Chez Pim for the entire list. You can search by prize type or find a prize in your area by searching by region. I can assure you from previous years there will be some amazing prizes.